My kids are already clamoring over all the toy catalogs that have been coming in the mail, looking wide-eyed page by page at the potential holiday bounty. They’re still on the young side to be begging for an electronic device, but portable media players of any kind are undoubtedly on many a wishlist. The options have come so far since the days of the good ‘ol Sony Walkman (R.I.P. 2010) and there are many products available, but I found a relatively new entry that’s a winner. pre-loaded with 1,000 songs and playlists from the genre of your liking. it’s all done for you. 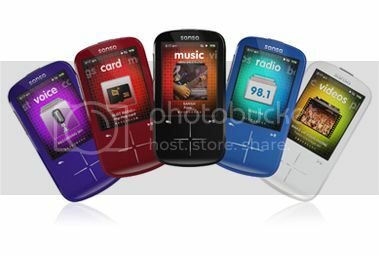 This could be a great gift for anyone who simply wants music on the go and doesn’t want to spend time downloading songs. The Fuze+ comes in different capacities: 4GB (1,000 songs) for $79; 8GB (2,000 songs) for $89 and 16GB (4,000 songs) for $119. Buy it at SanDisk or from our affiliate amazon at some nice prices.